“March of Mourning Set for Nation's Capitol,” Histories of the National Mall, accessed April 25, 2019, http://mallhistory.org/items/show/329. Plans for a March on Washington, organized by civil rights activist and labor leader A. Philip Randolph, gained momentum in 1941. 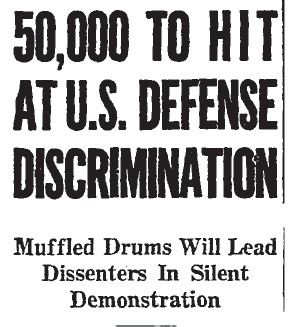 African Americans were frustrated by racial discrimination in the defense industry, one of largest industries at the time. African American leaders envisioned tens of thousands of marchers parading through the city and ending at the Lincoln Memorial. That Randolph choose the Lincoln Memorial as a rallying point was not surprising: the site had served as focal point for civil rights since segregated audiences participated in the memorial dedication in 1922. The Chicago Defender (National edition). The spectacle of 50,000 Negroes silently marching through the streets of Washington, behind muffled drums, will become a reality says Eugene P. Davidson, speaking for the Washington branch of the committee being organized by A. Philip Randolph to stage such a protest against unfairness of the administration in not doing more to see that Negroes are given jobs in the national defense projects. Two meetings, held in Washington recently, met with enthusiastic response and the leaders are planning an energetic drive to put over the program in the most effective manner. It is planned to have the marchers parade through the main thoroughfares of the city to the famous Lincoln Memorial, where Marian Anderson sang at the feet of the great emancipator and call upon the President to speak to the group there assembled. "We do not want any private meetings with committees," said Mr. Davidson. "We want the President to speak forthrightly on the problem and tell the world what this administration will and can do on behalf of the underprivileged minority groups in the city." Thorough coverage of the country is going to be attempted and buttons will be placed on sale to cover the costs of the hegira to the nation's capital. Radios, newspapers, advertisements all will be used in a concerted drive to put over the program, says Davidson.